Sprinkles, sprinkles and more sprinkles for Valentine’s Day. Valentine’s Day is one of my favorite holidays. It’s not the romance part that I get excited about… it’s the food and decorations. Pink and read hearts, doilies, cute cards, candy.. I love it. It’s a nice little break from the dark and dreary Portland winter. And it seems that every year it inspires me to do some baking. In the past I’ve made these heart cookies but this year I’m skipping the hearts and going straight for the sprinkles. 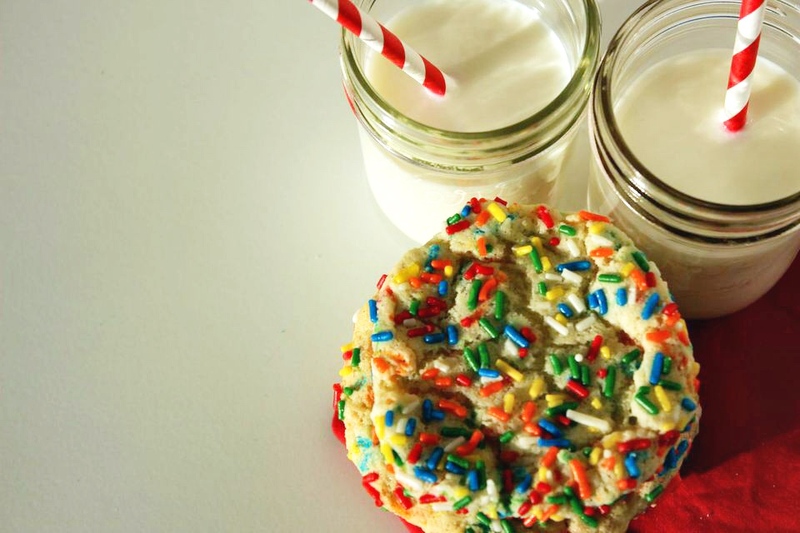 I’ve had my eye on these cookies our of Joy the Baker’s latest cookbook, Homemade Decadence. Whether it’s cookies, cakes or donuts I’m always a sucker for sprinkles. I was hoping to make these with Valentine’s sprinkles but I couldn’t find any that were quite right. So I went with these, the colors are a little more “Easter” than Valentine’s but in the end, it’s sprinkles, and that’s all I really want. I did not make any changes to the recipe, except the baking time. I think I made the cookies too big so they needed to bake longer. But I did double the batch and froze half of them. Turns out they’re really good straight out of the freezer. Enjoy! In a medium bowl, mix the flour, baking powder, cream of tartar, baking soda and salt. In the bowl of an electric mixer fitted with the paddle attachment, beat the butter and sugar at medium speed until light and fluffy, 3 to 4 minutes. Split the vanilla bean and scrape the seeds into the bowl. Add the egg and vanilla extract then beat until thoroughly combined. Reduce the mixer speed to low, and slowly add the dry ingredients. The dough will be thick (you may have to finish incorporating with a spatula). Fold in 1/4 cup sprinkles. Put the remaining 1/4 cups sprinkles in a bowl. Scoop 2 tablespoons of dough and roll it into a ball. 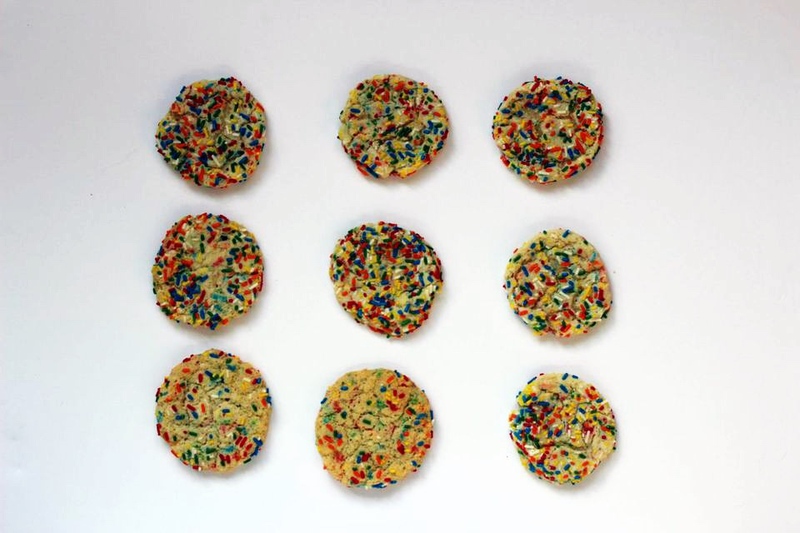 Dip into sprinkles to cover lightly. Put ball on a plate. Repeat with remaining sprinkles and dough. Put racks in the center and upper third of the oven and preheat oven to 350 degrees F. Line 2 large baking sheets with parchment paper. Transfer chilled dough balls to the prepared baking sheets, leaving about 2 inches between balls. Bake until the cookies have spread out and are just beginning two brown around the edges, but are mostly pale and soft, about 8 to 10 minutes. Let cool on the cookie sheet for 5 minutes before transferring to wire racks to cool completely. The cookies will keep in an airtight container for up to 4 days. Use a measuring spoon when creating dough balls. I made my cookies too large and had to substantially extend the baking time. 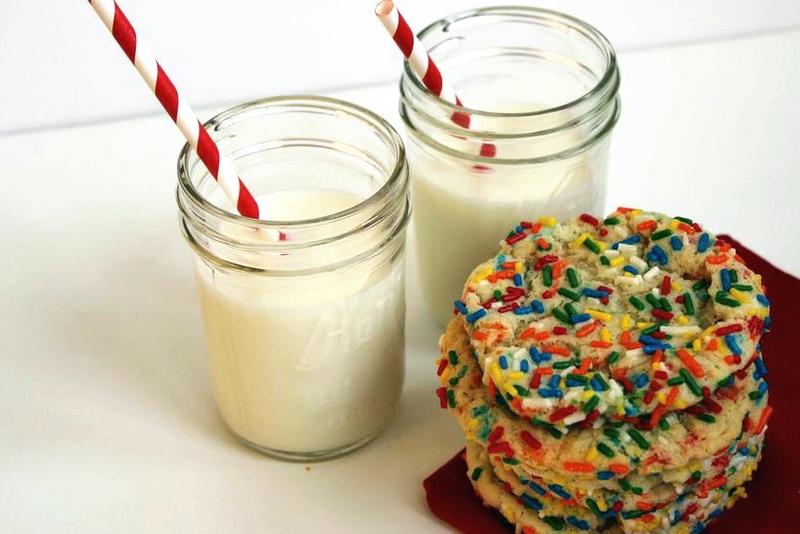 Love how you styled these with the milk, and sprinkles just makes me feel happy looking at them! I agree with Pech, I love the styling here! So whimsical! 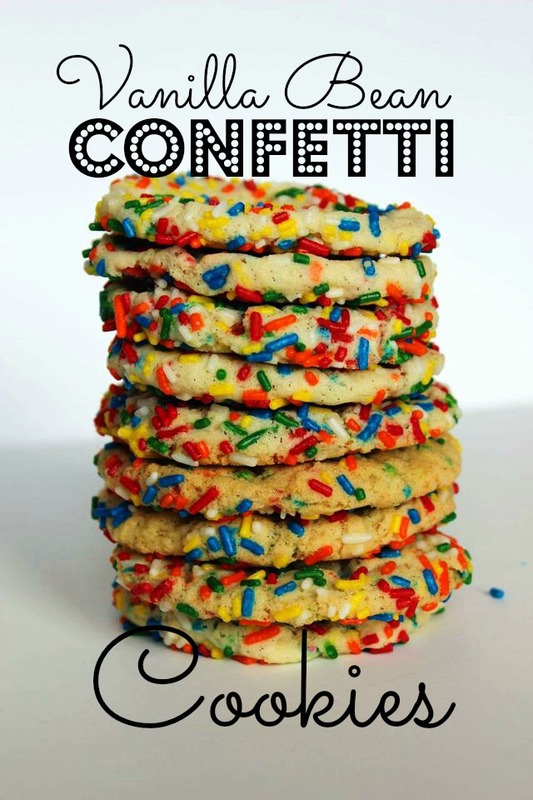 I also love all things confetti so I think these are bookmarked for a future recipe!! Thanks for sharing. Sprinkles just make me happy. I love the different ways you styled the photos. The stacked cookies… too cute! I’m a sucker for anything vanilla bean. Can’t wait to give these a try. These are so cute and fun! Great pictures, and the cookies look delicious! Sprinkles are fun! I don’t eat grains or processed foods, but might be fun to try a homemade colored sprinkle recipe sometime!